Similar to Cubasis Go! 3.0 Cubasis VST 3.0 but with many additional features such as 48 audio channels, 4 virtual sound sources (synthesizer, universal sound module, virtual bass, drum machine) and full MP3 support. Do it the way the professionals do. 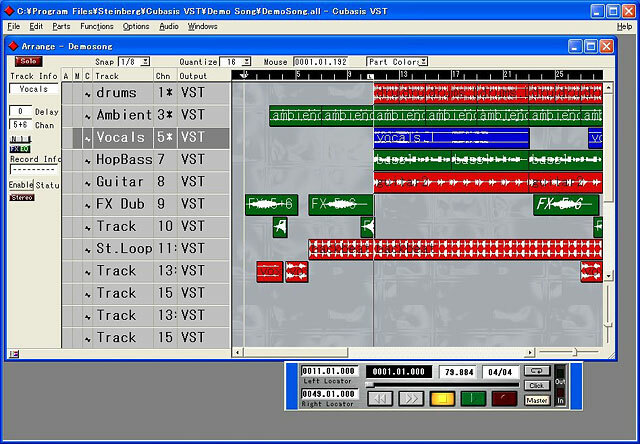 Cubasis VST gives you a complete music studio - in your PC. Up to 24 audio channels and 64 MIDI tracks, mixers, real-time effects, a virtual sound module and much more are waiting to be taken through their paces. The multimedia tutorial shows you how - in only a few minutes. Compose songs, edit, print scores, produce music videos and burns CD's. Cubasis VST lets you make your musical ideas a reality. At the time of writing, Steinberg have just released a minor update for Cubase VST's little PC brother, Cubasis VST. Revision 2 is a free 7Mb download from http://web.archive.org/web/20051026011247/http://service.steinberg.de/webdoc_ps_int.nsf/show/updates_applications_pro_pc_en and includes a selection of improvements and bug-fixes. Most prominent of the former is the incorporation of the same optimisations for Pentium III, Pentium 4 and AMD Athlon processors found in the full Cubase v5, while a shorter load time and working MIDI Clock support are also promised. Sam InglisCubase TipsIf you need to keep track of where you are in a Song, but it isn't practical to be sitting right in front of your monitor, then the SMPTE Time Display window (Show Big Time on the Windows menu) is your friend. As its name suggests, it's a window which shows the current Song time in large, easy-to-read characters. By default, the display is formatted in hours, minutes, seconds and frames -- but if you Option-click (on a Mac) or Control-click (on a PC) in the window, the current Song position in bars and beats will be displayed instead. Folder Tracks can be a good way to keep your Arrange Window tidy when working on complex Songs. 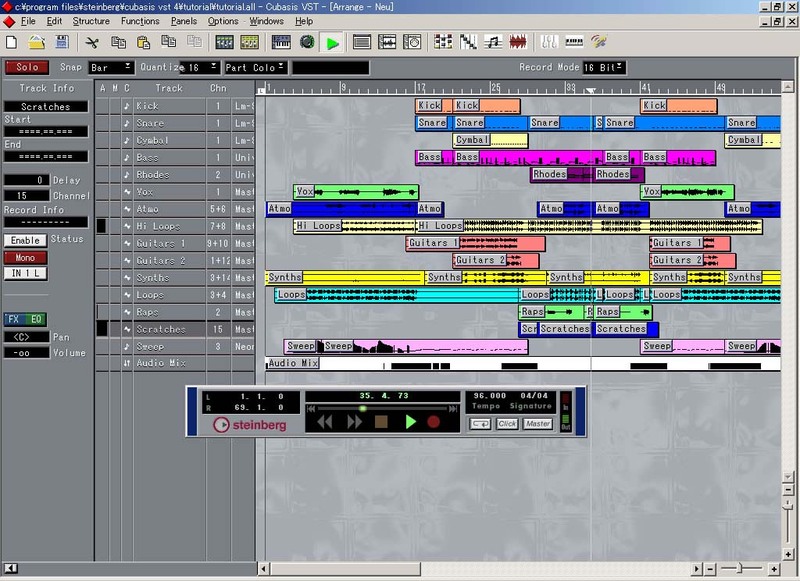 For example, if you start off building your track with either VST Instruments or external MIDI instruments, then bounce or record the Parts onto Audio Tracks, afterwards you may want to drag the no-longer-needed MIDI Tracks to a Folder Track, to make more room for working on the rest of the arrangement. Muting the Folder Track will mute all the Tracks inside it, to avoid confusion with the recorded Parts. If you receive an error message telling you that No More Mixer Channels are available when you try to select a VST Instrument, one possible culprit is Propellerhead Software's Reason -- even if you don't own the full version, just installing the demo can be enough to cause the problem. 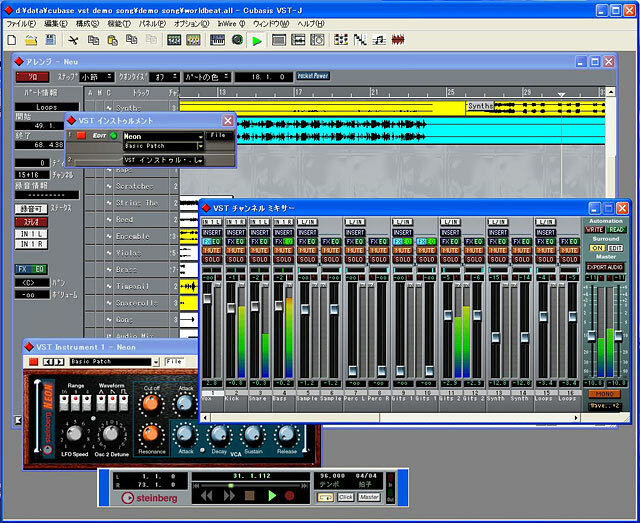 The reason for this is that Cubase automatically assigns an audio channel for every one of Reason's 64 ReWire channels on startup, thereby running the risk of using up all of its available channels. You can download a patch from the Propellerhead web site (www.propellerheads.se) to alleviate this problem by limiting Reason to just 16 channels. no dongle required - great place to start for newbies!